The passing of a public figure will bring out the kinder words about their life. What was, during their lifetime, "catastrophic" becomes, in death, "controversial." The mistakes become overshadowed by the legends. The rhetoric of obituaries becomes especially telling when the public figure is a political one, and a polarizing one at that. 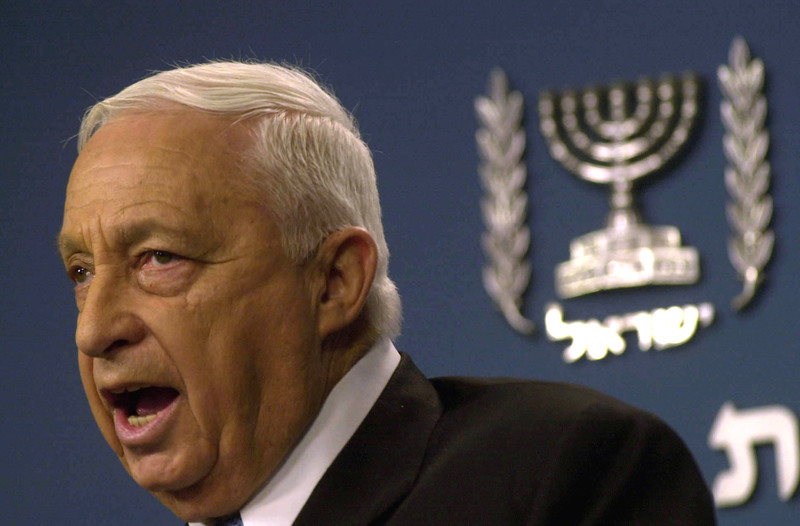 For many Israelis, the passing of former Israeli prime minister Ariel Sharon today, at age 85, means a goodbye to a warrior. To Palestinians and much of the international community, it is the end of 'The Butcher', the man who led the massacres in Qibya and in Lebanon's refugee camps. Sharon, or Ariel Scheinerman, was born in a farming village in the Sharon Valley in 1928, in Palestine, then still under a British mandate. He joined an underground Jewish military organization as a teenager and by 1948, he was commanding an infantry company. He founded a commando unit a few years later, and was charged with raiding the West Bank: one mission, on the village of Qibya, ended in the destruction of 45 houses (with men, women and children still inside), one school, and the deaths of at least 69 civilians. In 1956, Sharon was again in charge of an attack, this time into Egyptian territory on the Sinai peninsula. His parachute brigade, which captured the strategically-crucial Mitla Pass, ended in so much bloodshed that even the army's Chief of Staff condemned it as unnecessarily brutal. But he gained hero status among Israelis after the 1967 Six-Day War, during which troops under his command recaptured the Mitla Pass and a key strategic crossroads called Um Cataf, a move which is widely considered the main way that Israel was able to take Sinai from Egypt. After ending his army career, he became first defense advisor to Prime Minister Yitzhak Rabin, then minister of agriculture to Menachem Begin. Under Begin, he launched his project to install permanent Jewish settlements in the territories occupied by Israel in 1967. A few years after that, he became minister of defense. In that role, he ordered the two ruinous invasions of Lebanon in 1982, during which his army laid siege to Beirut, forcing thousands of Palestinians into refugee camps. Breaking a promise he had given to the U.S., Sharon then allowed troops to go into those same refugee camps — the result was a death toll between 800 and 2,000 refugees, and an inquiry into the massacre that led to his prompt resignation. He stayed in government, though, and became Prime Minster in 2001. In that role, his two defining projects, although admired by some, drew anger from many, including Israelis, Palestinians, and the West. His building of the separation wall around the West Bank was widely condemned by the international community (and ruled illegal by the World Court) and his choice to withdraw settlers and troops from Gaza — which some saw as a sign of the possibility of peace — was aggressively criticized by settlers and Israel's right-wing. Exhausted from the opposition in his own party, he resigned from the Likud in 2005, in the hopes of forming a new centrist party, Kadima. But soon after, two successive strokes, in 2005 and 2006, left him in a vegetative state until his passing today. "As far back as almost every living Israeli can remember, Sharon was in battle, pushing onward, annexing more and more territories to the Jewish state, and depriving it of its last remnants of moral innocence. More than any other single figure in Israel, Sharon led the transformation of a relatively modest and ascetic state into an occupying bully ... Fifteen years after the decolonization of Algeria, he attempted a colonial project that had an idiosyncratic rationale behind it: to create a situation that would force the Jews to defend certain parts of the land whether they liked it or not ... The project had no vision, no political context, and no international legitimacy ... [Yet] his basic belief was that it is necessary to climb toward the peace summit even without the intention of reaching it. For him, such a summit was a perilous place, from which one might tumble into the abyss of war."